Who wouldn’t be excited to spot a seahorse in the wild? They’re fascinating, mysterious, and compared to other fish they look pretty unusual. Each seahorse has a horse-like snout, skin instead of scales, and a prehensile tail. Most species of seahorses mate for life, and are monogamous. When the time comes to reproduce the females will deposit their eggs into the males who then undergo pregnancy and give birth. Currently there are 48 species of seahorses (give or take a few awaiting confirmation.) 38 of those species have been assessed for their conservation status so far. According to the IUCN Red List ten of these species are Vulnerable, one is Least Concern, and one is Endangered. The remaining 26 are assessed as data deficient. This means we have no idea about the level risk of extinction facing 36 of 48 species of seahorses. What we do know is that seahorses are definitely at risk. Research shows that their unique life histories and behaviours make them more vulnerable to population decline. 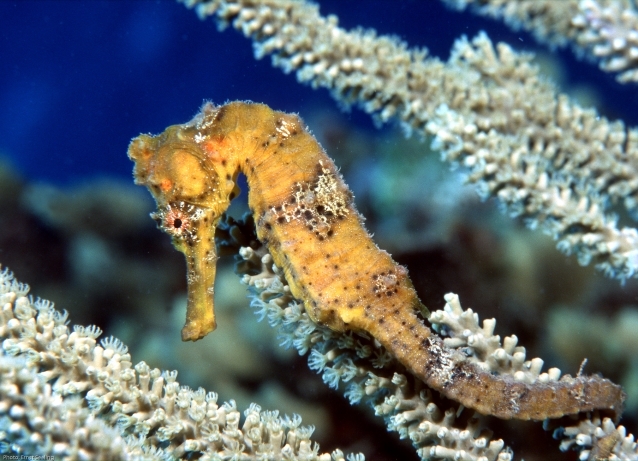 Habitat destruction puts pressure on seahorses, and overfishing leads to large quantities of seahorse by-catch. Every year, 15-20 million Hippocampus individuals are caught and traded, dead and alive, all over the world. They are displayed in aquariums, used as ingredients in traditional Chinese medicine, and turned into curios. Seahorses are very difficult to study in the wild. Some species are smaller than 3 cm in size, and they are all able to blend, chameleon-like, into their surroundings. Seahorses also have a near-global geographical range, found off the shores of every continent except Antarctica. There’s a desperate need for more data, but there just isn’t enough time and funding, not to mention experts qualified and willing to conduct the necessary field studies before these species are further imperilled. This is where iSeahorse comes in. iSeahorse is an online database of seahorse sightings, which utilizes the power of citizen science to gather data for research and conservation. Anyone, regardless of their prior knowledge of seahorses, can contribute. The data is also accessible to anyone, so other scientists or interested members of the public can perform their own analyses. iSeahorse was created by Project Seahorse, one of the world’s leading research institutions studying seahorse biology and conservation. The group is based out of the University of British Columbia and the Zoological Society of London. To contribute to iSeahorse an individual simply needs to spot a seahorse in the wild, take a photo if possible, and then report this sighting to iSeahorse. Sightings are recorded through either the website http://www.iseahorse.org or the free iPhone app (http://bit.ly/LXBAo1) available from the App Store. iSeahorse asks for information along with each observation and users are encouraged to provide as much possible. Sightings are georeferenced, which will help us to better understand where each species lives, eats and mates. ID guides are provided on the iSeahorse site to help users differentiate between species while identifying. Project Seahorse staff also actively review all observations and can help with identification when photos are posted. Project Seahorse is currently working to implement a seahorse trends monitoring program through iSeahorse, which will help assess population changes over time. These data should then help us to zero in on areas of conservation concern that need to be protected. While this seems to be a great solution to the seahorse data deficit, some people might question the data’s validity and use in research. Although precautions need to be taken at every stage of citizen science research from data collection to analysis, these hurdles can be overcome by data verification and appropriate statistical analyses that factor in varying degrees of uncertainty. However citizen Science does more than just allow us to gather massive amounts of free data. While species conservation is a pressing concern globally, there is a huge gap between science and society. Much scientific data is either unavailable to the general public, or communicated through scientific publications, which can often be cumbersome and loaded with jargon unfamiliar to most people. “So, if you’re a diver, snorkeller or someone who might come into contact with seahorses in the wild, sign up for iSeahorse! Getting the public involved in science directly, by allowing them to contribute to research efforts and see the raw data, and later conclusions for themselves, is a way to bridge this gap. Making involvement in science easy and accessible can facilitate a growing engagement in society with species conservation. Websites like iSeahorse.org create communities where scientists and citizen scientists can communicate and work together towards a common goal. So, if you’re a diver, snorkeller or someone who might come into contact with seahorses in the wild, sign up for iSeahorse! You can contribute to the community by posting your sightings or helping to ID other sightings. Citizen science is an incredibly useful tool for conservation and seahorses, and their diverse marine habitats will no doubt benefit from your efforts.